We did a simple spruce up on this kitchen with a new tile backsplash, new appliances, and quartz counter tops accented with a under mount stainless steel sink. 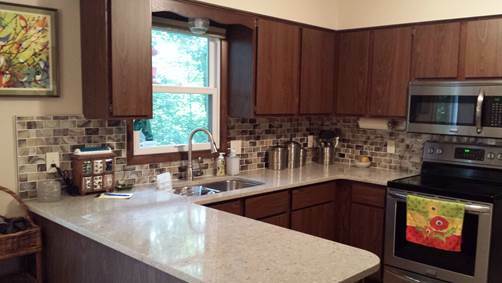 After the project was completed; the backsplash and counter tops had turned out so beautiful the homeowners wished they would have replaced the cabinetry as well. Hard surface counter tops such as quartz and granite can take up to 4-8 weeks from template to installed. The time is determined by the type of material and the fabrication process. Because there is such a large selection of hard surface products, most need to be ordered and shipped to the fabricator. Some fabricators keep a few popular colors in-stock that can be chosen from. This can cut the frabrication time by half. 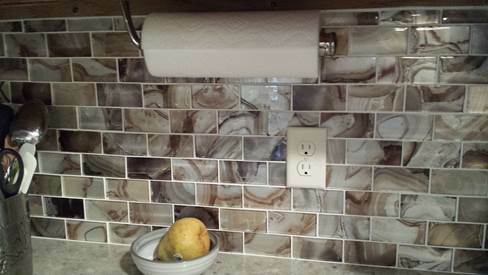 Backsplash was Elida Ceramica Volcanic Essence, grout-ed with unsanded white grout. The appliances were Frigidaire Gallery Stainless Steel and black. The counter tops were Allen Roth Sammish with a Moen Anabelle Spot Resistant Stainless pull down faucet to finish off the look.